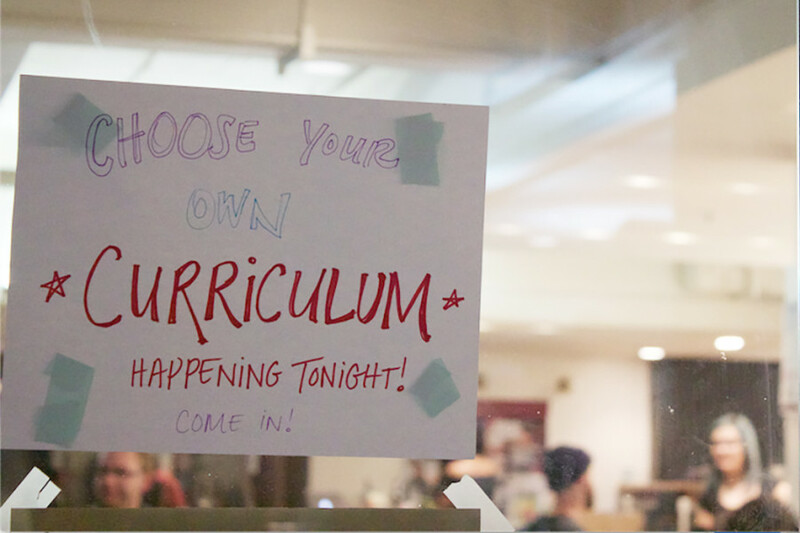 The Sustainability Action Fund hosted a brainstorming session on a proposed 45-credit Leadership in Sustainability major at the Hive Co-op Café Thursday night. Fuelled by wine, snacks, markers, and paper, attendees broke into small groups to talk about what they wanted to learn about, and their expectations of the new major. The event was the latest step of a multi-year process in conjunction with Concordia University’s 2012-2016 academic plan. According to the SAF, the lack of course options on environmental sustainability partially motivated the creation of the major. In 2014, the SAF commissioned a curriculum report that found that of Concordia’s 2,129 courses, just 150—amounting to seven per cent—contained some sustainability content with much of it concentrated in 300- and 400- level classes. Social sciences offered the most “sustainable” courses, with 16 per cent, while the humanities had the least, at a little under three and a half per cent. “In many ways Concordia is behind the curve in terms of sustainability-oriented education,” said Christina Bell, sustainable curriculum project coordinator at SAF, and an author of the above report. The University of Waterloo offers several programs related to sustainability. Its School of Environment, Resources and Sustainability has undergraduate, graduate, and doctoral opportunities. Its professor Jennifer Clapp was recently named Royal Society of Canada Fellow. Closer to home, McGill has its Sustainability, Science & Society Interfaculty Bachelors of Arts and Science Program. It centers on three thematic pillars: science and technology; economics, policy, and governance; and ethics, equity, and justice. McGill’s degree prepares its graduates to work in the public sector, for NGOs, and in consulting. While Concordia has courses related to environmental sustainability, it lacks the concrete curricula, learning objectives and infrastructures of Waterloo and McGill. The new major is being created in collaboration with the Loyola College for Diversity and Sustainability. The college currently offers a minor in diversity and the contemporary world and one in sustainability studies. The courses offered this past semester include LOYC 240: Global Environmental Issues and Ecological Justice and LOYC 340: Culture and Communication. “This major will feature LOYC courses and draw on the expertise of the college in order to be a success,” Bell said. The proposed leadership in sustainability major would be a very small program, with just 30 students, and would require students to take either another major or minor from a different university program. The major’s 12-credit core would include a 200-level Loyola College course called “Approaching Sustainability.” The foundation level, also consisting of 12 credits, would consist of one biology and one philosophy course, and two courses from the Geography, Planning & Environment Department. In May 2014, the SAF hosted a workshop to design the potential curriculum. Sustainability experts were brought in to speak, and participants had the chance to design their “dream courses.” These ideas were considered in the creation of the curriculum. The program’s goal is to prepare students for both the working world and other educational opportunities. While the sustainability major’s structure has been created, the work is far from over. The process of creating a new university major involves 15 steps and often takes several years. The first part is a letter of intent that indicates that the new program supports the overall goals of the university and provides value to students. Following approvals by the provost and the dean of the faculty, the new program proposal is created. This proposal requires a curriculum, a financial statement and evidence of learning or interdisciplinary collaboration.Concordia Senate needs to present final approval. Because the content of the major’s courses has yet to be determined, students won’t be seeing the program for at least a couple of years. “There is a lot to think about and that’s what the team of faculty, staff, and student representatives working on this project have been up to for quite some time,” Bell said.